Manchester UMC is called to stay strong! This is the period of time when we faithfully dream of our ministries for next year, and how to fund them. It’s also an opportunity to take stock of what has been happening around this amazing place. 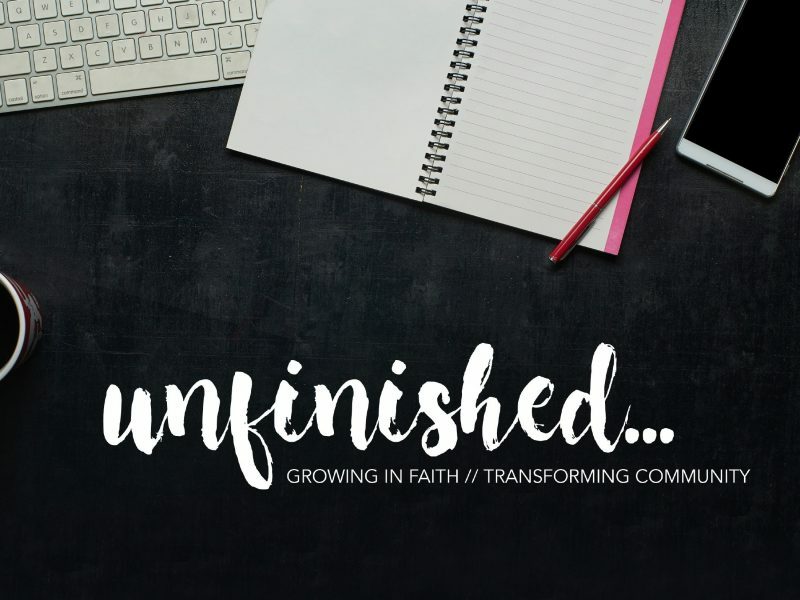 I hope by now you’ve received a very attractive, informative pamphlet entitled, “Unfinished: Called to Stay Strong!” If you haven’t, you can view it online. First, I hope you’ll use this booklet as a devotional resource. Simply be amazed at how God is at work! You’ll notice many new things we did over the past 12 months that address the needs of our community, from initiating Facebook Live, to holding events such as Prescription to Addiction. All this is in addition to the thousands of people who’ve come through our doors for events ranging from Fall Festival to the Joy of Music concert series. And we haven’t even mentioned the thousands of people impacted by our worship, faith formation, and mission ministries. Plus, when you turn to the back of the booklet, you’ll find the goals we’ve set for the coming year, which I noted in last week’s eblast. Second, use the booklet as a guide to help you participate in growing our ministries. Not only will you find information regarding our finances and capital needs, but also how you can make a difference. You have an opportunity to make a first-time pledge, renew the Unfinished pledge you already made, increase your pledge, or make a special gift to reduce mortgage debt, and build a fund for a new heating and cooling system. Throughout October, I urge you to prayerfully reflect on these opportunities. What lies ahead is truly exciting, and knowing you’re enabling it through your generosity is priceless. Truly, the Lord is an abundant God. Thank you for your generosity and helping us make the most of God’s abundance! Remember that this is a great opportunity for prayer, devotion and fellowship! Each week we’ll hear a story from a staff/church member, as well as have an opportunity to lift up people/concerns in prayer. If you have a story to share, please let me know! Just email me. My sermons in October look at how our church can model the early Christian community. That community intentionally provided a place where Christians could gather for worship, study and fellowship. Similarly, we will celebrate the amazing place we call home, here at Manchester UMC. My sermon will be based on Acts 4:31-35. What a wonderful beginning to our livestreaming ministry! The past two weekends we’ve had 3100 folks view the services at least some of the time! Remember that to have the opportunity to worship with your church family while away, you need to connect with us through Facebook. Visit our website for more information. A special thanks goes out to our Director of Communication, Phil Wiseman, and our Audio Visual Arts Director, Brian Gagliano, for getting this up and running. We’re also grateful for our volunteers. If you’d like to be part of AV team, email Brian. This year we will be part of a cluster Charge Conference. While we will fulfill the approving of reports, the emphasis this year will be upon training led by Rev. Roger Ross, Director of the Center for Congregational Excellence. All members are welcomed. Voting members are the Leadership Board and retired clergy whose charge conference is at Manchester UMC.